Request. Hmmm, I'm spotting a few similarities to something else here! :o) But true bypass switching and so without the famous buffer. 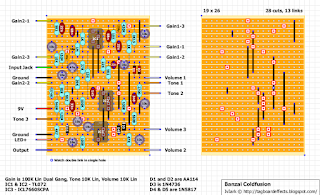 It does have a lot of changes though and some of them will undoubtedly make a difference and affect the final tone, so worth a build for you Klon fans. Note the two required ground connections, just daisy chain the connection or add a column and link if you prefer. The Cold Fusion Overdrive is a true overdrive that naturally melts with your guitar and amplifier rather than just changing your sound. The pedal has two distinct fields of application: If the Gain control is set at zero the Cold Fusion is providing more than 25dB of clean boost - more than enough to seriously overdrive the preamp tubes of your amplifier and get a natural cranked amp tone. When you turn the Gain up past 9:00 you can gradually add more and more distortion. The Gain control is a dual pot that controls different parts of the circuit simultaneously, to produce a transparent, warm overdrive at any setting. The Gain knob and the Tone knob are useable throughout their whole range and are capable of producing many shades of overdrive. The spectrum extends from "touch of dirt" to "bluesy tube sound". Unlike other overdrive pedals the Cold Fusion Overdrive doesn't have that nasty nasal, mid-rangey taste to it and it doesn't lose bottom end when cranked. An impressive crystal clear boost and fat, dirty overdrive sounds are the hallmarks of the pedal. The active tone control lets you cut or boost different parts of the frequency spectrum with no loss.A true bypass with LED indicator instead of a cheap input buffer and a 2,1mm barrel jack 9V connector are standard features with Banzai. 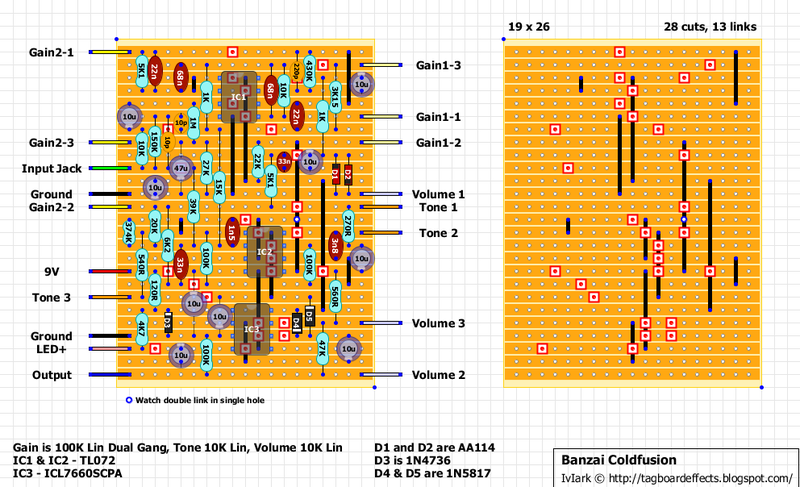 Revised layout based on the updated Klon layout. The choice is yours. 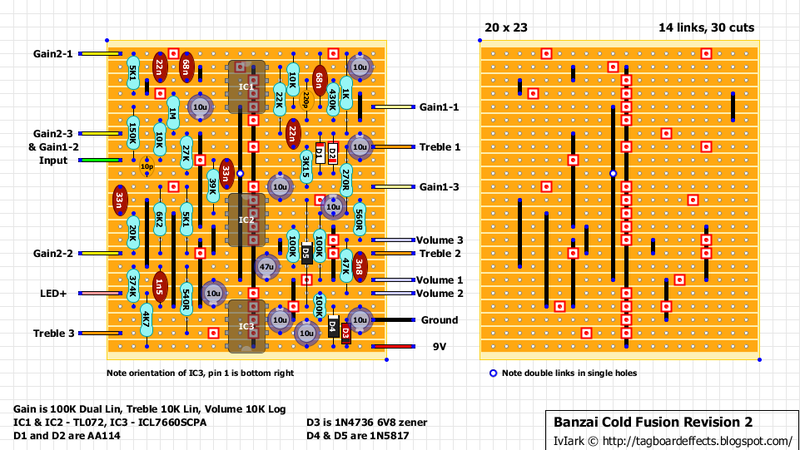 boy, with all of those weird resistor values and diodes, it'll be a while before I can get around to building this one. Will 5818s work for D4 and D5, and a 5014a for D3? - 1/2watt 6.8v. I know the NTE5014a will, and the 5818's should also work. they only have a slightly higher voltage drop and that's at 1 amp. Cool. Finished my build - didn't work at first and I was getting too high of voltages on IC and I realized two of the socket pins were not soldered *facepalm* Sounds very good. I used 1N34a diodes for D1 and D2, they're socketed so I'll try and find some AA114s. Thanks Mark for doing the layout!! Nice one, thanks for verifying! For some reason, this reminds me a lot of the Klon Centaur. Similar layout, two TL072s and a charge pump, even the same pots. And now that I've read the description I'm almost sure of it, hah. I have been having some issues with my build I wasn't sure what it was. I replaced D4 and 5 with 5817 diodes and I'm not getting 12V after the diodes. I thought maybe the ones I got were bad and replaced them with 1N4001s and get the same result - 6v after the diodes and 6v at Pin 8 on IC 2, which is supposed to be 12v. May the Charge Pump be bad? If so, is there a way to test it to confirm (other than replacing it heh)? Hi guys, I've built this and its sounding great as a boost pedal. It has loads of volume, but when the gain knob reaches 3 oclock it seems to be as gainy as it gets. if I turn the knob past 3 oclock (up full) the gain drops out. Could this be a faulty pot or a problem with my circuit? Does anyone know where the output goes on version 2?